Since summer is here for those of us who happen to live in the northern hemisphere (as well as the rest of the tropical countries of the world, where it is perpetually summer), there is nothing better to wear outside than a comfortable pair of flip flops, along with another pair of shorts and a comfortable cotton t-shirt, of course. Well, some of the cheaper flip flops need to be broken in, so to speak, but the more expensive ones are comfortable right from the get go. 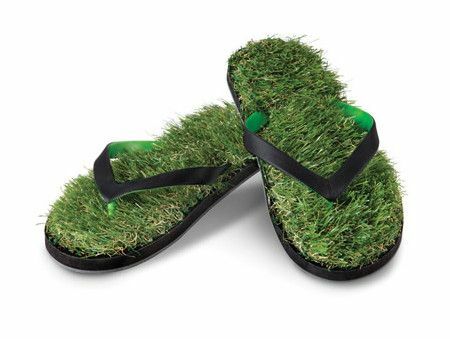 My money is on the $24.95 Fescue Flip Flops that these are comfortable enough to slip on right after purchase, where they have been lined with artificial turf that feels like freshly mowed grass. Of course, the “grass” that you see here is fake, which means there will be no fresh-smelling grass, but it sure looks all too comfortable to slip one’s feet in. Best of all is, you need not water this patch of “grass”.